I first discovered Oh La La Cafe six years ago when a friend took me for brunch. I've been going regularly ever since, bringing friends traveling through Bangkok to try it out. Here's why it's one of my favourite brunch spots in the On Nut district of Bangkok. The cafe is owned and operated by a lovely Thai woman named Oh, who spent a few years living in the USA before returning to Thailand to open this cozy little cafe. She was inspired by Western cuisine and you can see that in her food. Oh is super friendly and I always enjoy chatting with her when I visit Oh La La Cafe. She's also very accommodating and if you have any special requests or dietary restrictions, she'll be happy to adjust her dishes. You can have locally grown organic avocado in just about any dish here. It's served in salads, omelettes, sandwiches, and of course, guacamole. In fact, it can be ordered as a simple side dish. One thing I often miss about home is a good sandwich, and Oh La La is where I get my fix. The cafe has a selection of hot and cold sandwiches all available on white or whole wheat, baguette or croissant. I'm a fan of their tuna mozzarella sandwich with pickled jalapenos. The Special de Hans has smoked salmon and Brie, and the Veggielicious has avocado salad, smothered with cream cheese and lightly sprinkled with salt and pepper. Oh La La Cafe also does great grilled cheese sandwiches. Eggs - However You Like Them! You can order your eggs sunny side up, scrambled, or boiled. My personal favourite is the omelette served with smoked salmon, ham, mushrooms, spinach, feta cheese, avocado or anything else you might want. Left: spinach omelette. Right: vegetarian breakfast. Recently, I tried the Oh La La twist on deviled eggs. 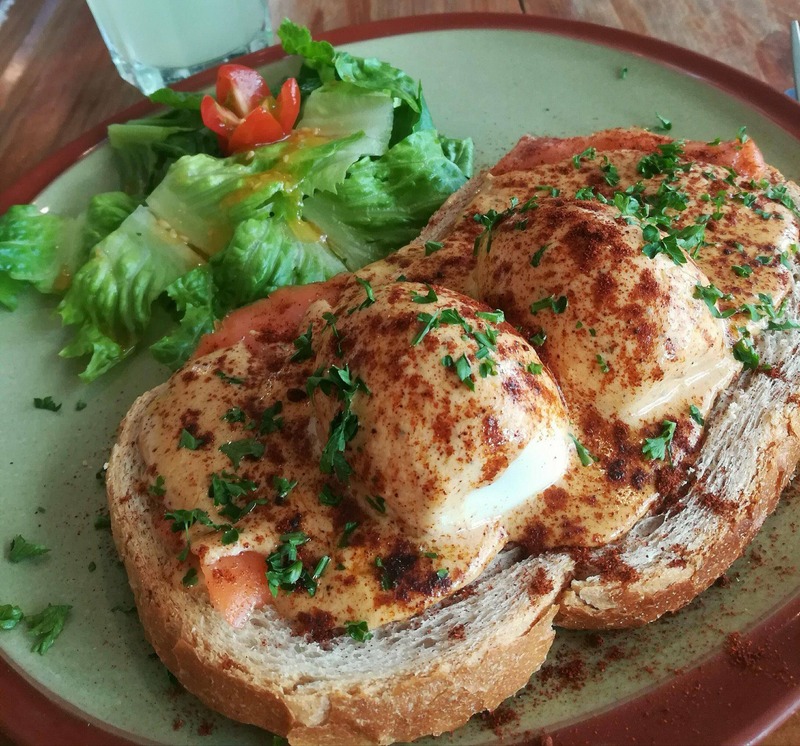 Two soft boiled eggs served on a slice of toast with smoked salmon and topped with cheese sauce and paprika. It's certainly different to any deviled eggs I've ever tasted - and delicious! Dessert is my favourite part of any meal and brunch is no different. The cafe has homemade chocolate brownies, cookies, homemade carrot cake, apple crumble, banoffee, lemon meringue pie and even a vegan chocolate cake. Oh is always experimenting and coming up with new dessert ideas. My favourite is her homemade chocolate brownie and red velvet cheesecake, which she made for Valentine's Day. Two of my friends loved it so much, they requested it as their wedding cake! 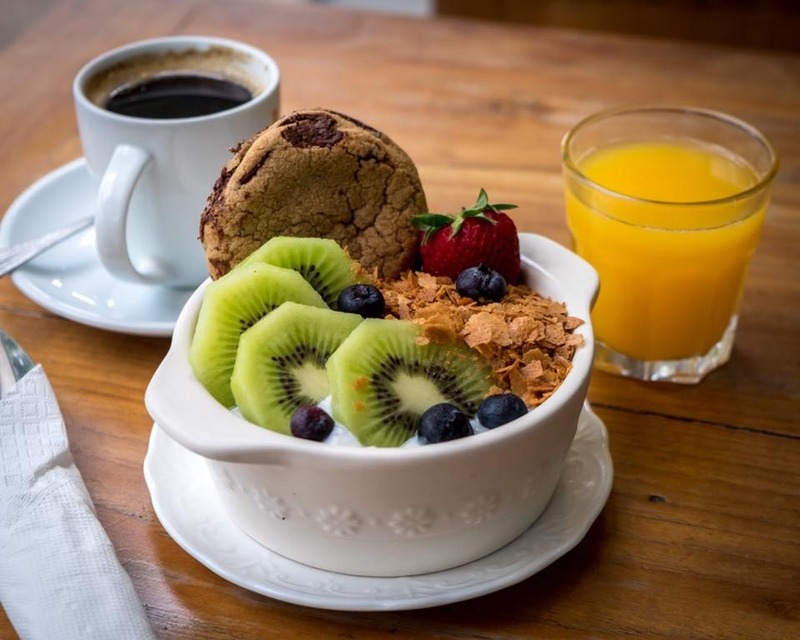 The cafe is small so dessert options are limited and rotate on a constant basis - but that guarantees that everything is fresh. Whatever selection you find when you visit, there's sure to be something you like. If you're looking for a light meal, but still need to satisfy your sweet tooth, then go for a hot chocolate. Mine came with a free Madeleine on the side! 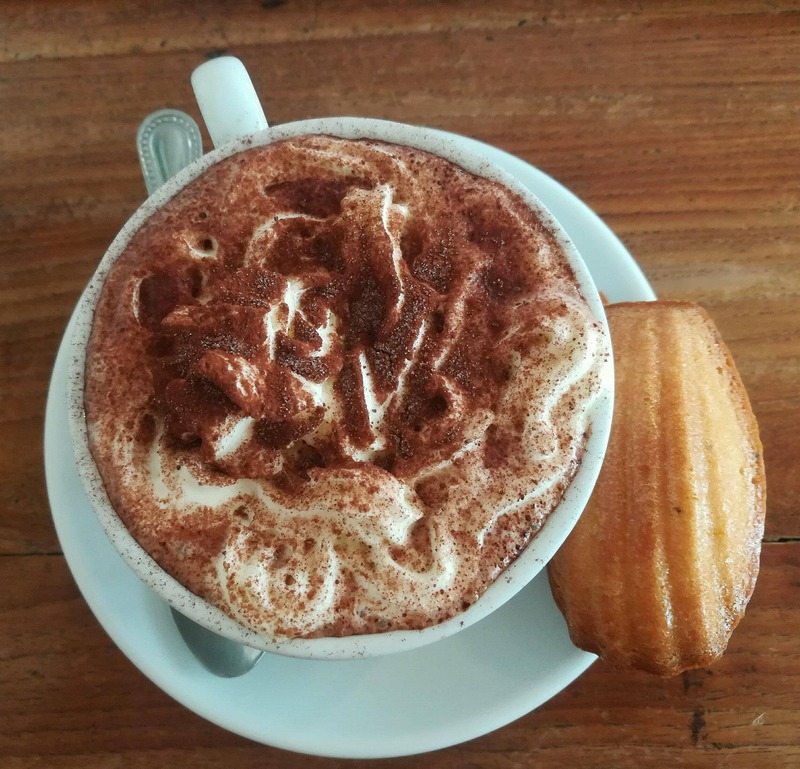 Hot chocolate with whipped cream and a Madeleine. 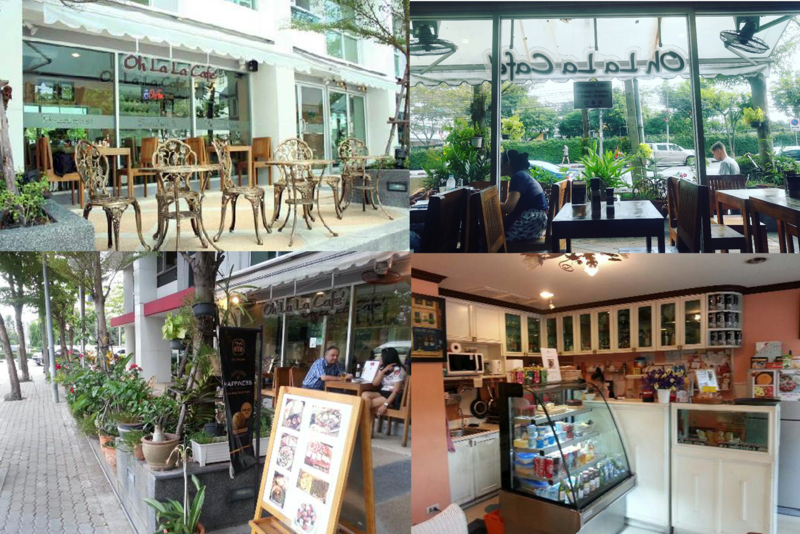 Oh La La Cafe is located on Sukhumvit 50, just off On Nut BTS. Exit the BTS next to Tesco Lotus, turn left down Sukhumvit 50, and walk straight for just a few minutes. You'll see it on the right side of the road.